Click Here to book with Best Price Guarantee! Flyaway with us at Vegas Indoor Skydiving! Vegas Indoor Skydiving is an indoor skydive simulation facility that allows guests to experience the thrill of a real free fall skydiving experience without the need for an airplane or parachute! Conveniently located just a block from Las Vegas Boulevard and the Las Vegas Convention Center, Vegas Indoor Skydiving is the perfect way to add some real adventure to your Las Vegas vacation! 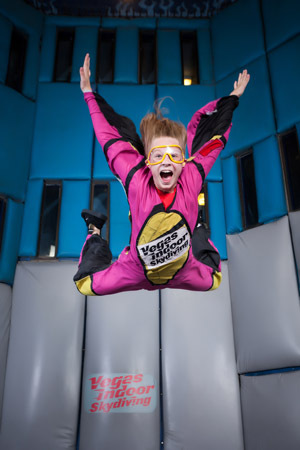 Vegas Indoor Skydiving uses a vertical wind tunnel to introduce guests to the sport of Indoor Skydiving. The tunnel produces enough wind to support the weight of an average adult. At Vegas Indoor Skydiving, each flyer attends a brief training class, suits up in all the necessary flight gear, then jumps in the tunnel and flies! A mesh trampoline floor, padded walls, and experienced instructors to assist you to make your indoor skydiving adventure as safe as possible. The entire experience takes just about an hour, but leaves memories that will last a lifetime! • Dress in comfortable clothes with socks and sneakers. • The minimum weight for participation is 40 pounds. • Minors are required to have a parent or guardian present during flight training. Our suggested height and weight restrictions are important. Guests who exceed the maximum weight are not guaranteed to generate enough lift to actually fly. Being outside the weight guidelines is not a safety issue as much as the quality of flight. We don’t want to take your money and then not be able to provide a high-quality experience. Depending on how someone is built, or if they are really tall, we can sometimes be flexible with the maximums. We are often asked why the restrictions are different for men and women, the answer is simply that men and women are built and carry their weight differently. Feel free to contact us if you have any further questions. Reservations are highly suggested by calling (702) 731-4768. Mention coupon code V4L.